Weekends are 'splashy' at Hilton Colombo - the 'Dine to Dive' deal offers the Hilton Colombo diners free use of the swimming pool on weekends and public holidays. Those who patronize any of the Hilton Colombo restaurants are entitled to a splashy weekend at the cool, blue waters of the hotel pool which will bestow a fabulous weekend experience. Spices Restaurant serves a dynamic weekend buffet to energize the holiday spirit whilst Emperor's Wok, offers the best of Chinese Dim Sum by Master Chef Eric from Shanghai. The cheerful brews and snacks at the Echelon pub and contemporary culinary creations for dinner by Bocuse d'Or finalist Chef Buddhika at Spoons are definite dining venues for a slow down weekend. Oven hot pizzas at Il Ponte, authentic Sri Lankan dinner buffet at the Curry Leaf and paired snacks with Ceylon tea at the Thorana Lounge are chill out settings for an ideal relaxation. 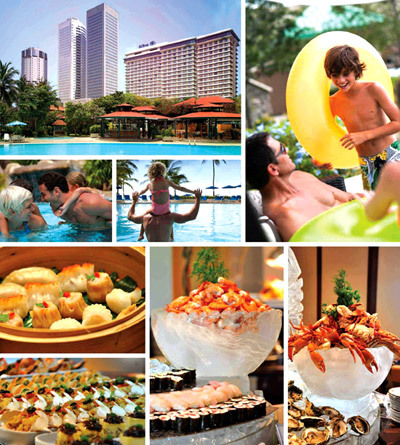 Children from 6 to 12 years dine at half price plus baby pool access during weekends is free of charge. Hilton Colombo has always been the trendsetter when it comes to food, events and celebrations. Moving on with 25 years of service excellence Hilton Colombo is always geared to offer the best for their customers.